Vanessa continues about the “real” food and photo props: “For lunch, we had hot dogs, corn on the cob, nachos & cheese, french fries and soft pretzels. I put out plastic nacho trays, paper hot dog trays, and paper cups to serve the food so that the kids could run around and play while they ate. 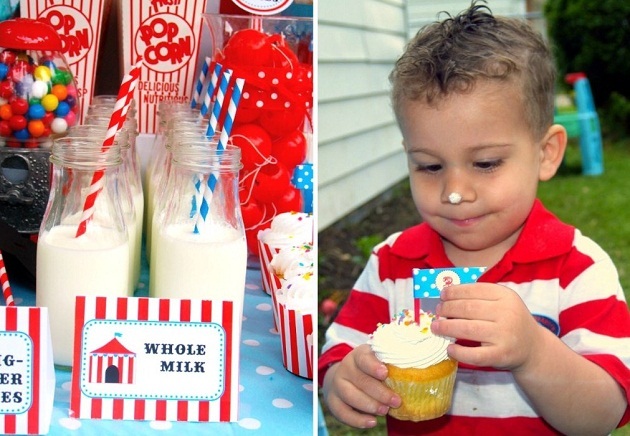 This is such a darling party for you to get some great ideas from. Thanks for sharing it with us Vanessa! I love that awning! This party has so many amazing, fun details. OMG! I love the strongman barbells! so creative! The canopy is just fabulous! 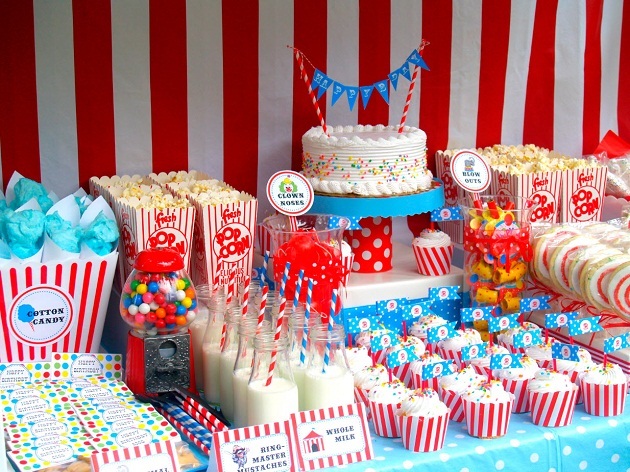 Where did you get the blue with white poka dot table cover? Hi Somar, I think most fabric stores would probably carry a similar fabric. If not, you could try a google search for an online retailer. Good luck! Nikki, I don’t see her Etsy shop any more but I would suggest contacting 5 to 9 Events directly – the link is in the post. 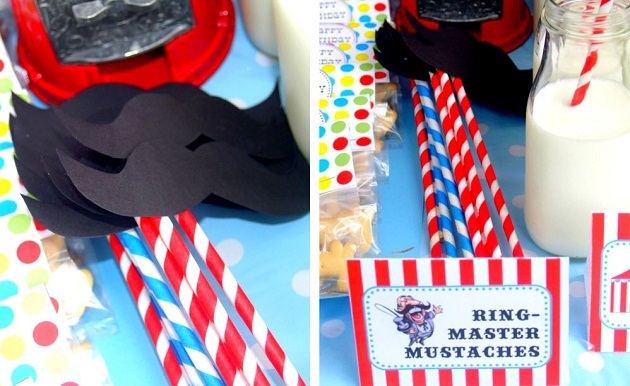 Really, really lovely party ideas & photos. However, I was dismayed at the “step right up….and when *your* done…” The incorrect grammar is not consistent w/ attention to detail. (your/you’re) I would pull that photo out. Otherwise, I love the post. This is super cute. 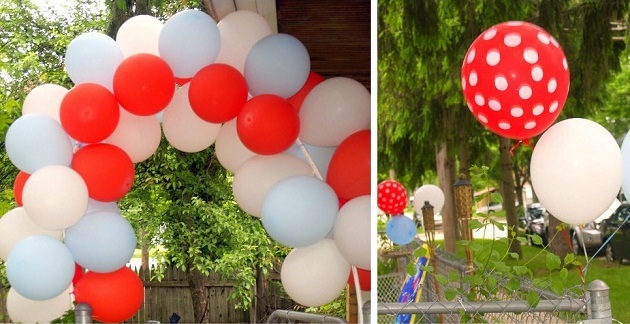 I am throwing my little nephew’s birthday in a few months. I was wondering how did u make the canopy? I cant find one anywhere? 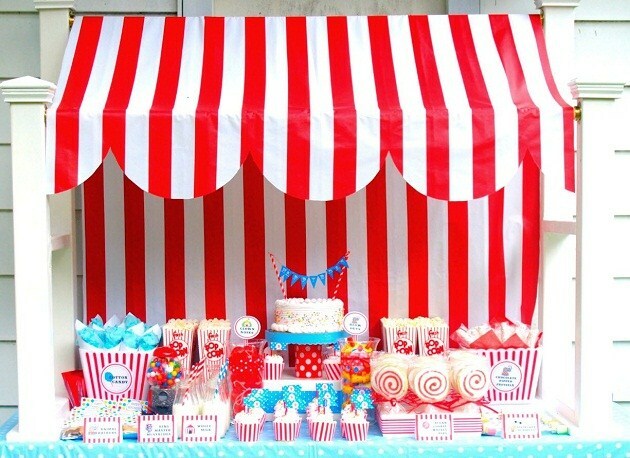 I absolutely love the awning! How did you create this? hi i love everything…especially the dumbells may i know how it came out like that.wat did you use aside from marshmalows. I would love to know what you used to make the strong man dumb bells. Great ideas!! Alisha, it’s 2 marshmallows attached in between with a skewer or lollipop stick (covered by a stripey straw). 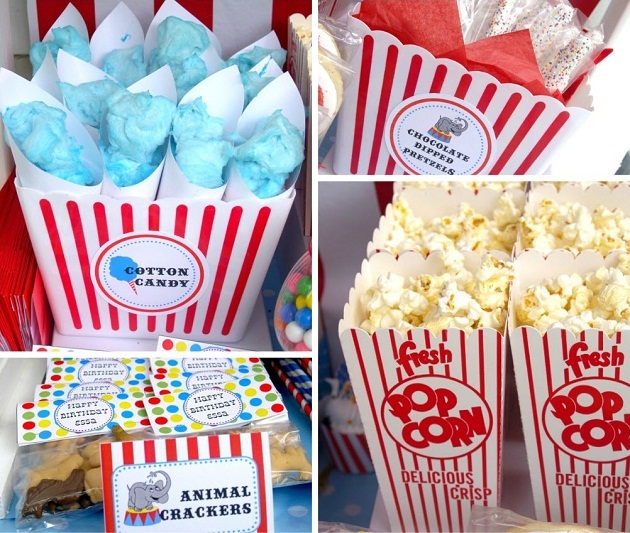 How can I get all of these party favors? Love the party. Do you know how Vanessa & her Husband builted the canopy? I would love to have it. We are planning circus party. Hi Lin, there was no diy for it. If you do a little Googling or Pinterest searching I bet you can find a tute for one. Let us know if you do! hey, what color table clothes were the individual tables? and where there any centerpieces? also what did the invitations look like? Sara Sue this is all the information we have about this party. Unfortunately it looks like the blogger, 5 to 9, is no longer in service.